A report on the BBC News website yesterday – Antique engines inspire nano chip – discussed a new computer design based on the use of nanoscale mechanical elements, which it described as being inspired by the Victorian grandeur of Babbage’s difference engine. The work referred to comes from the laboratory of Robert Blick of the University of Wisconsin, and is published in the New Journal of Physics as A nanomechanical computer—exploring new avenues of computing (free access). Talk of nanoscale mechanical computers and Babbage’s machine inevitably makes one think of Eric Drexler’s proposals for nanocomputers based on rod logic. However, the operating principles underlying Blick’s proposals are rather different. The basic element is a nanoelectromechanical single electron transistor (a NEMSET, see illustration below). 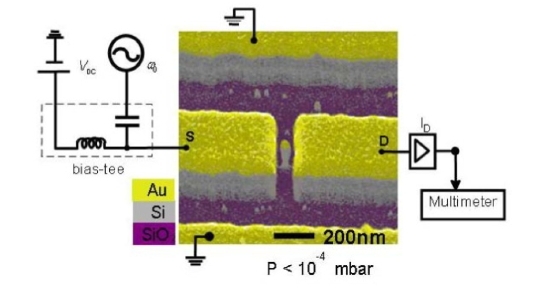 This consists of a silicon nano-post, which oscillates between two electrodes, shuttling electrons between the source and the drain (see also Silicon nanopillars for mechanical single-electron transport (PDF)). The current is a strong function of the applied frequency, because when the post is in mechanical resonance it carries many more electrons across the gap, and the paper demonstrates how coupled NEMSETS can be used to implement logical operations. Blick stresses that the speed of operation of these mechanical logic gates is not competitive with conventional electronics; the selling points are instead the ability to run at higher temperature (particularly if they were to be fabricated from diamond) and their lower power consumption. Readers may be interested in Blick’s web-site nanomachines.com, which demonstrates a number of other interesting potential applications for nanostructures fabricated by top-down methods. A nano-electromechanical single electron transistors (NEMSET). From Blick et al., New J. Phys. 9 (2007) 241. There was a flurry of activity with this latest news from the ever diligent Richard. The is a group currently working with our realm to build a Difference engine which will trigger a Light Board patterned after the Babbage model. The notion that you could build such a machine on the Nanometre scale has suddenly brought that camp within our group into the arena, adding their growing expertise to the mix, and creating more excitement. What I find most enjoyable is sitting back in my newly acquired Aeron Chair, for some reason one of our suppliers thought I should have one, and watching all these previously lost minds at work. Small horn blow if I may. We have entered into negotiations with the FEI Company to acquire a ‘Phenom’ Microscope for the Camp One Lab. This will greatly enhance our visualization capabilities as the opportunities for exploration grow.